FICO has just released data on fraud patterns on 52 million active UK debit cards, and the patterns are a mixed bag of good, bad and scary. Most customers find the debit fraud statistics of greatest concern because this reflects their own money, as opposed to a credit or charge card where a customer often views fraudulent usage as “the bank’s money.” Criminals that plunder debit cards often have to move quicker and with greater agility because funds are often in shorter supply – i.e., only what is in the checking account plus any overdraft – and losses can be spotted more quickly as current funds are drained with no regard for other regular commitments. The most startling figure relates to cross-border fraud. 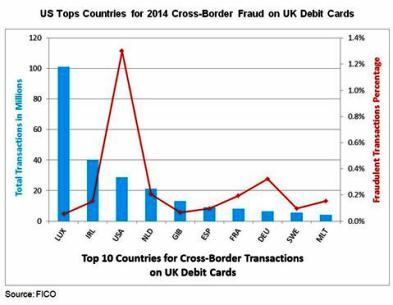 The percentage of fraudulent transactions on UK debit cards that come from cross-border use rose 25 percent. What’s more shocking is that nearly half of these fraudulent cross-border transactions – 47 percent – took place in the US. 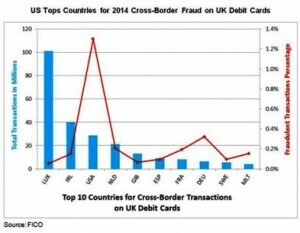 As shown in the chart above, the US was only the third highest country in terms of overall cross-border transactions on UK cards, but by far the highest for fraud. This is especially pertinent when one considers the additional risk that should arise in countries with far higher card payment activity, such as Luxembourg, the central processing hub for the likes of PayPal’s card-not-present (CNP) transactions. Why is the US-based cross-border fraud so prevalent? As with the figures FICO released earlier this month, showing an unprecedented spike in fraudulent ATM cash-outs, the US continues to be a target area for criminals because they have not yet implemented EMV technology. Now that they are, and the first liability shift is taking effect later this year, it seems that criminals are in a rush to exploit the weakness before the US bolsters its defenses. The growth in cross-border fraud also overlaps with a rise in CNP fraud, which accounted for 68 percent of all fraudulent debit card transactions, and 84 percent of cross-border fraud transactions. CNP accounted for 63 percent of total fraud losses and 57 percent of cross-border fraud losses. However, CNP fraud transactions decreased by 3 percent and CNP fraud losses remained flat at £98 million between the two periods. So what’s the good news? Total fraud losses for the cards in the sample decreased 7 percent, to £156 million. Furthermore, all of this rich data on transactions and their characteristics was used by our dedicated data scientists to build new predictive models for FICO® Falcon® Fraud Manager. Thanks to my colleague (and co-blogger) Scott Zoldi and his team, yesterday’s fraud patterns are turned into tomorrow’s fraud prevention.